Phase I Core Analytics – Italy July 2007 For regional/core country team use only. Not for external use. 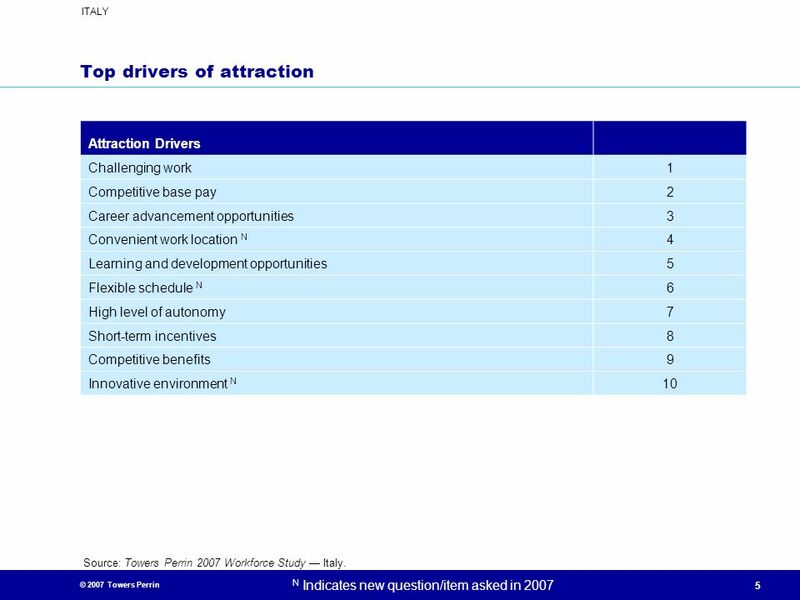 Attraction Drivers Challenging work 1 Competitive base pay 2 Career advancement opportunities 3 Convenient work location N 4 Learning and development opportunities 5 Flexible schedule N 6 High level of autonomy 7 Short-term incentives 8 Competitive benefits 9 Innovative environment N 10 Source: Towers Perrin 2007 Workforce Study — Italy. 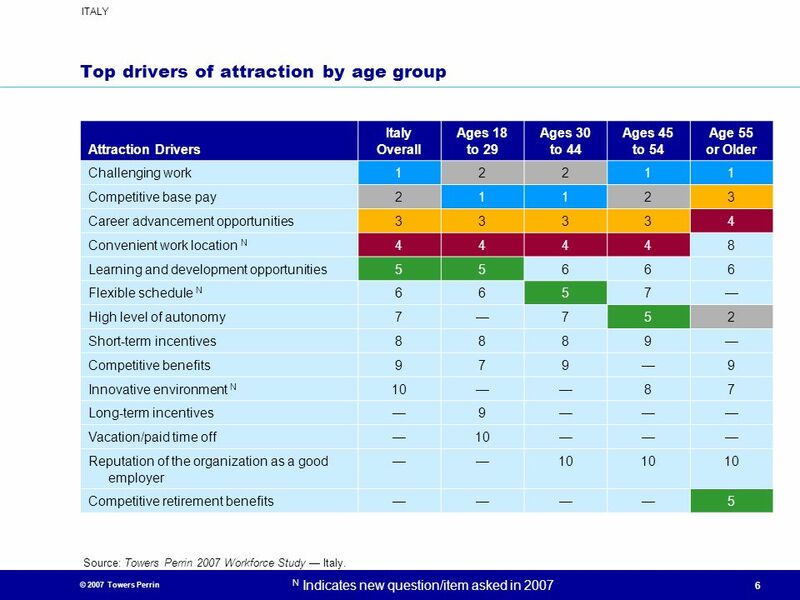 Attraction Drivers Italy Overall Ages 18 to 29 Ages 30 to 44 Ages 45 to 54 Age 55 or Older Challenging work 1 2 Competitive base pay 3 Career advancement opportunities 4 Convenient work location N 8 Learning and development opportunities 5 6 Flexible schedule N 7 — High level of autonomy Short-term incentives 9 Competitive benefits Innovative environment N 10 Long-term incentives Vacation/paid time off Reputation of the organization as a good employer Competitive retirement benefits Source: Towers Perrin 2007 Workforce Study — Italy. 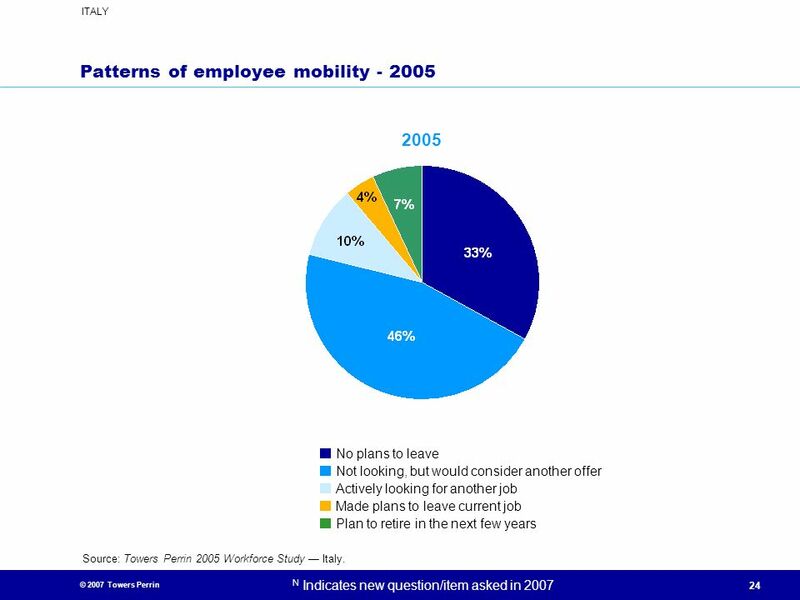 2007 No plans to leave Not looking, but would consider another offer Actively looking for another job Made plans to leave current job Plan to retire in the next few years Source: Towers Perrin 2007 Workforce Study — Italy. Presentation Title Drivers are shown in descending order of importance Competitive career development N Salary criteria are fair and consistent Organization’s reputation in community N Manager acts quickly if I ask for help Saturday, March 25, 2017 Can impact quality of work/product/service Satisfaction with the organization’s people decisions % Favorable Source: Towers Perrin 2007 Workforce Study — Italy. 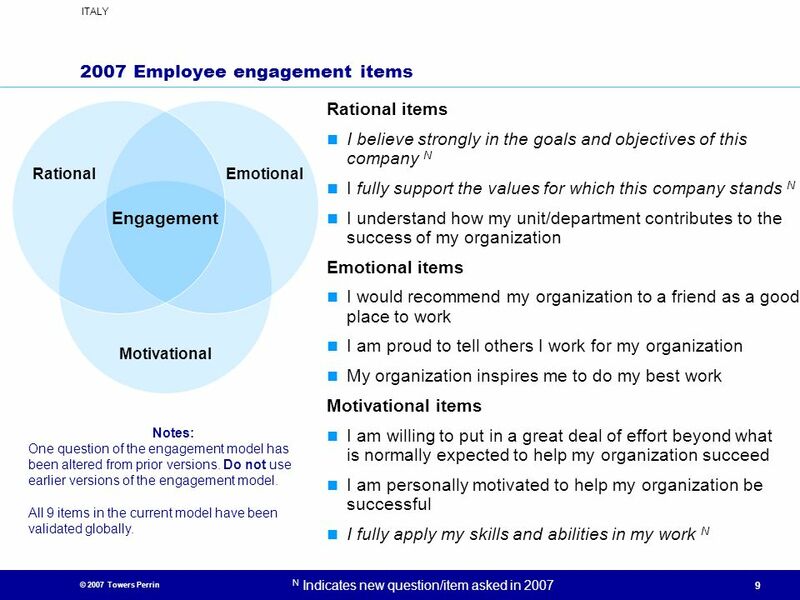 Presentation Title 2007 Employee engagement items Rational Emotional Motivational Engagement Rational items I believe strongly in the goals and objectives of this company N I fully support the values for which this company stands N I understand how my unit/department contributes to the success of my organization Emotional items I would recommend my organization to a friend as a good place to work I am proud to tell others I work for my organization My organization inspires me to do my best work Motivational items I am willing to put in a great deal of effort beyond what is normally expected to help my organization succeed I am personally motivated to help my organization be successful I fully apply my skills and abilities in my work N Saturday, March 25, 2017 Notes: One question of the engagement model has been altered from prior versions. 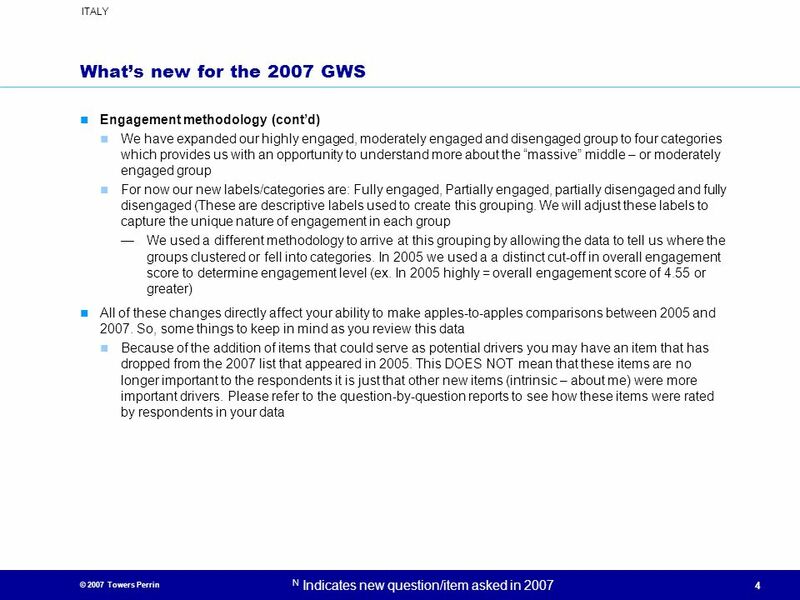 Do not use earlier versions of the engagement model. All 9 items in the current model have been validated globally. Presentation Title Respondent scores on the components of engagement Rational Components Believe in organization's goals/objectives N Support organization’s values N Understand how my unit contributes to organization’s success Emotional Components Recommend organization as a good place to work Proud to tell others I work for my organization Organization inspires me to do my best work Motivational Components Saturday, March 25, 2017 Willing to put in a great deal of effort to help my organization succeed Personally motivated to help organization succeed Apply skills/abilities in work N % Favorable Source: Towers Perrin 2007 Workforce Study — Italy. 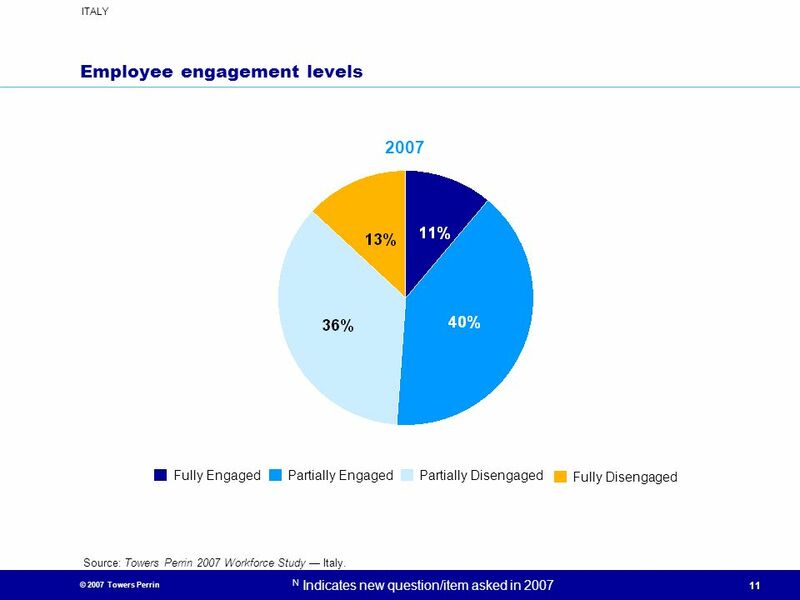 2007 Fully Engaged Partially Engaged Partially Disengaged Fully Disengaged Source: Towers Perrin 2007 Workforce Study — Italy. 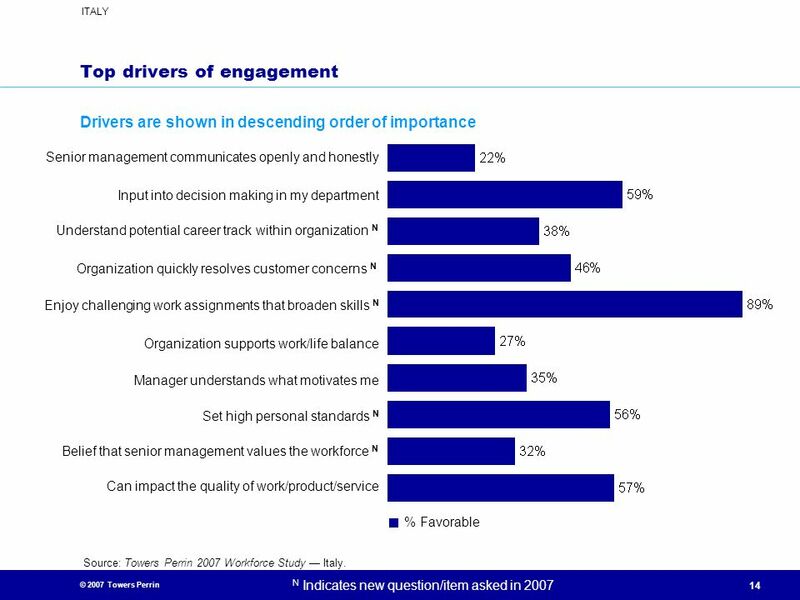 11% 40% 36% 13% Source: Towers Perrin 2007 Workforce Study — Italy. Source: Towers Perrin 2007 Workforce Study — Italy. Drivers are shown in descending order of importance Senior management communicates openly and honestly Input into decision making in my department Understand potential career track within organization N Organization quickly resolves customer concerns N Enjoy challenging work assignments that broaden skills N Organization supports work/life balance Manager understands what motivates me Set high personal standards N Belief that senior management values the workforce N Can impact the quality of work/product/service % Favorable Source: Towers Perrin 2007 Workforce Study — Italy. Presentation Title I can impact the quality of our work/product/service I can impact costs I can impact customer satisfaction I can impact the overall profitability of my organization Saturday, March 25, 2017 I can impact revenue growth Engagement matters because it links to high performance behaviors Even countries with low overall engagement scores show that the “highly engaged” employees do feel they impact quality, cost and customer service I can impact innovation of products/services N Fully Engaged Partially Engaged Partially Disengaged Fully Disengaged Source: Towers Perrin 2007 Workforce Study — Italy. 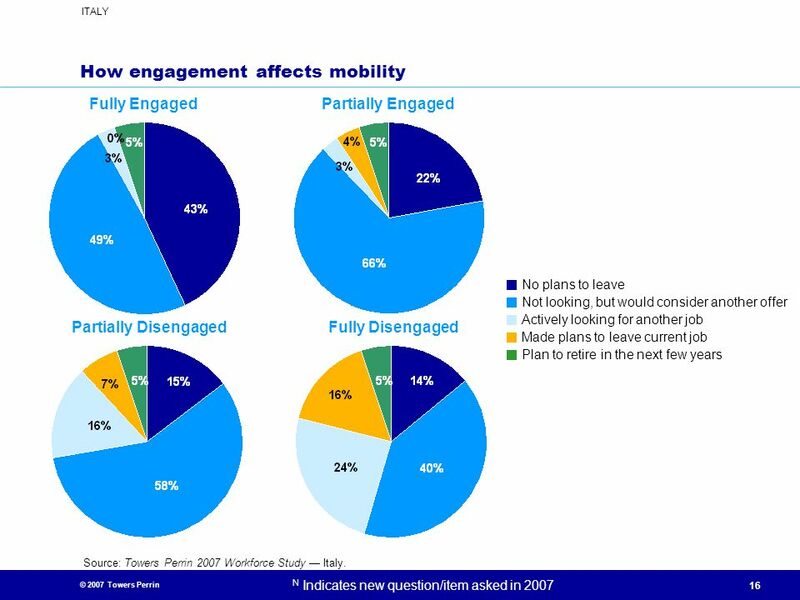 Fully Engaged Partially Engaged No plans to leave Not looking, but would consider another offer Actively looking for another job Made plans to leave current job Plan to retire in the next few years Partially Disengaged Fully Disengaged Source: Towers Perrin 2007 Workforce Study — Italy. 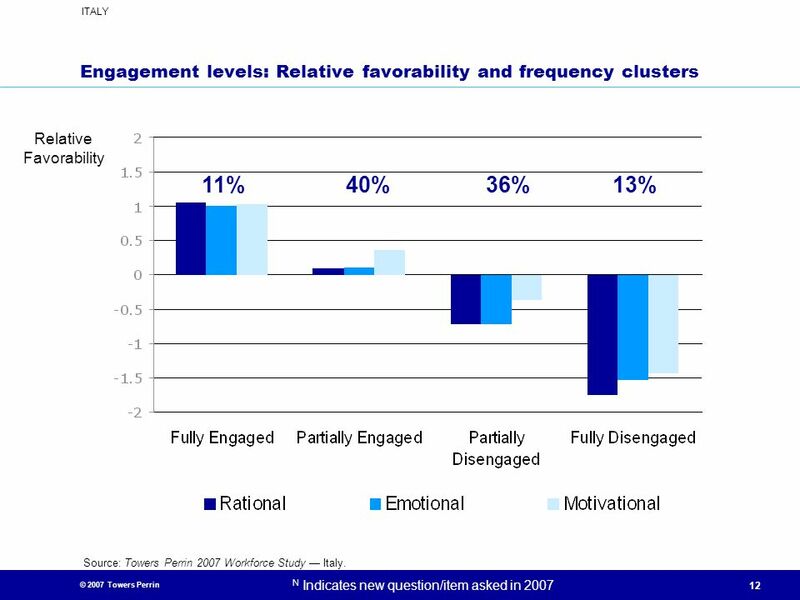 Using a similar methodology used to derive engagement and retention drivers, we looked at which senior management behaviors drive a respondent’s feelings towards senior management (Q1225 – How do you feel about your senior management?) 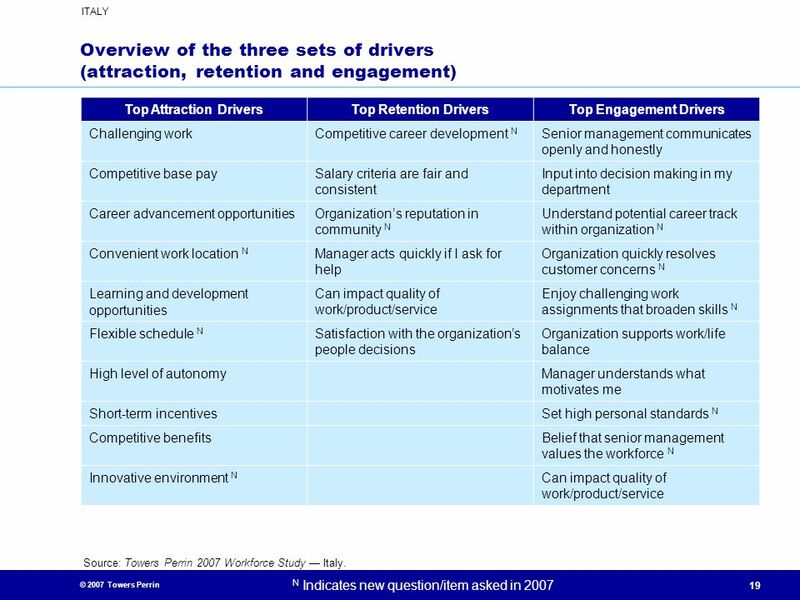 Drivers are shown in descending order of importance Senior management sincerely interested in employee well-being Senior management tries to be visible and accessible Senior management acts in customers’ best interests Senior management communicates openly and honestly Senior management’s has communicated clear vision for long-term success Senior management actions consistent with our values % Favorable Source: Towers Perrin 2007 Workforce Study — Italy. 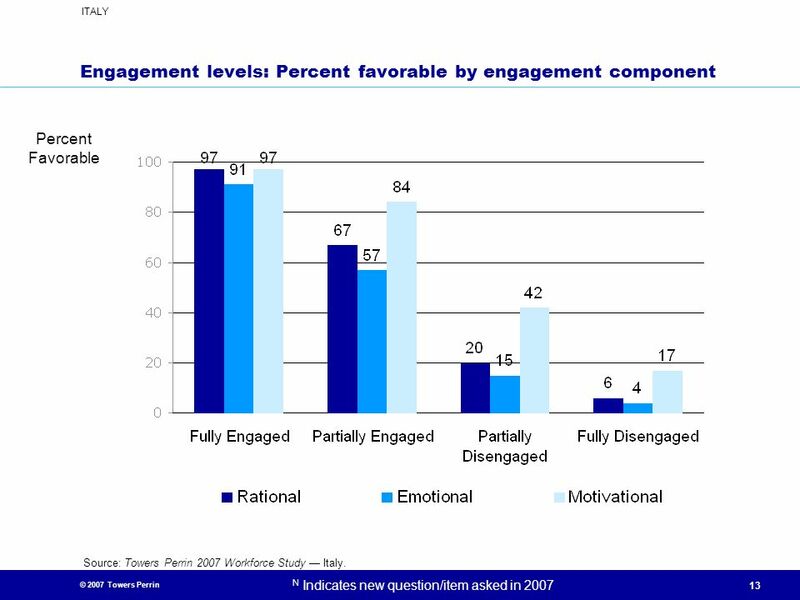 Using a similar methodology used to derive engagement and retention drivers, we looked at which immediate manager behaviors drive a respondent’s feelings towards their supervisor (Q1212 – How do you feel about your boss?) 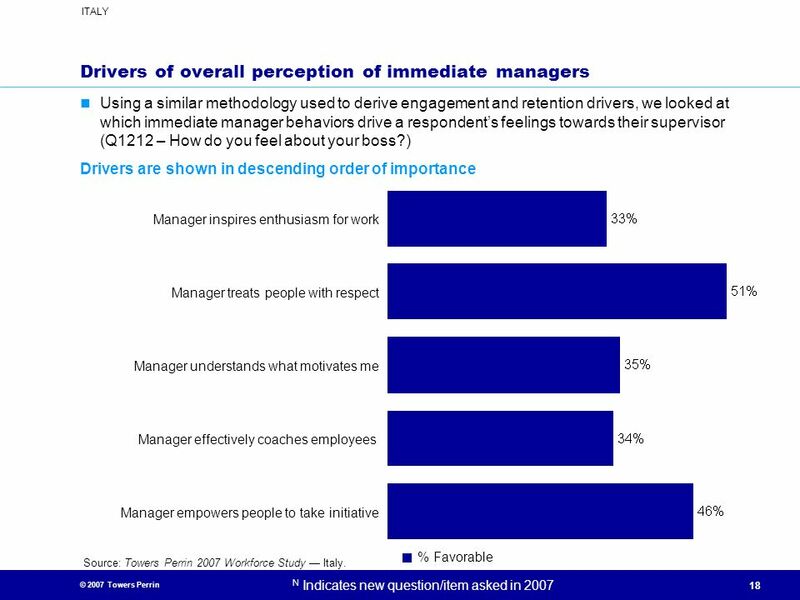 Drivers are shown in descending order of importance Manager inspires enthusiasm for work Manager treats people with respect Manager understands what motivates me Manager effectively coaches employees Manager empowers people to take initiative % Favorable Source: Towers Perrin 2007 Workforce Study — Italy. 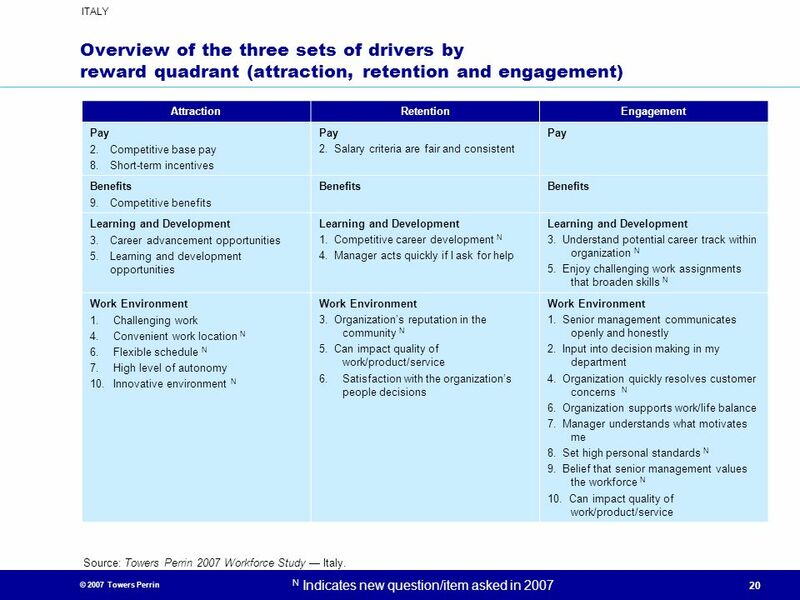 Overview of the three sets of drivers (attraction, retention and engagement) Top Attraction Drivers Top Retention Drivers Top Engagement Drivers Challenging work Competitive career development N Senior management communicates openly and honestly Competitive base pay Salary criteria are fair and consistent Input into decision making in my department Career advancement opportunities Organization’s reputation in community N Understand potential career track within organization N Convenient work location N Manager acts quickly if I ask for help Organization quickly resolves customer concerns N Learning and development opportunities Can impact quality of work/product/service Enjoy challenging work assignments that broaden skills N Flexible schedule N Satisfaction with the organization’s people decisions Organization supports work/life balance High level of autonomy Manager understands what motivates me Short-term incentives Set high personal standards N Competitive benefits Belief that senior management values the workforce N Innovative environment N Source: Towers Perrin 2007 Workforce Study — Italy. Pay 2. Competitive base pay 8. Short-term incentives 2. Salary criteria are fair and consistent Benefits 9. Competitive benefits Learning and Development 3. Career advancement opportunities 5. Learning and development opportunities 1. Competitive career development N 4. Manager acts quickly if I ask for help 3. Understand potential career track within organization N 5. Enjoy challenging work assignments that broaden skills N Work Environment 1. Challenging work 4. Convenient work location N Flexible schedule N High level of autonomy 10. Innovative environment N 3. Organization’s reputation in the community N 5. 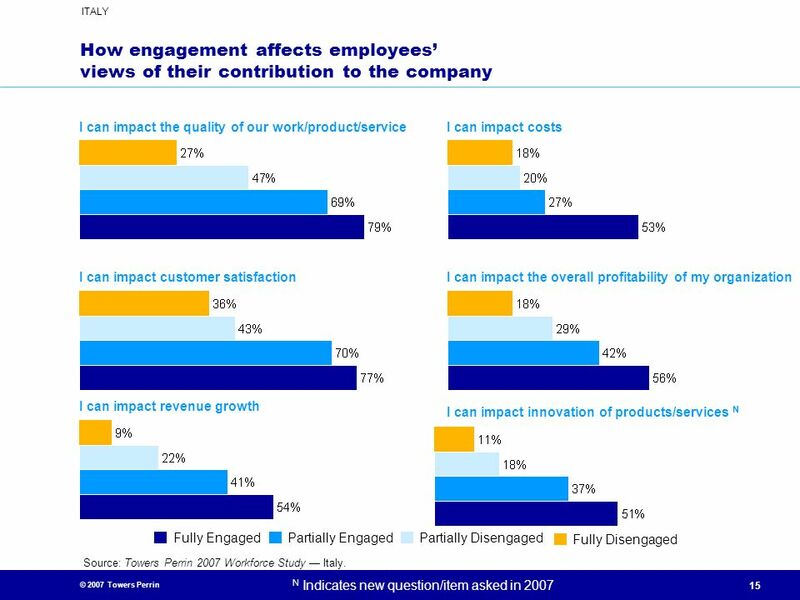 Can impact quality of work/product/service 6. 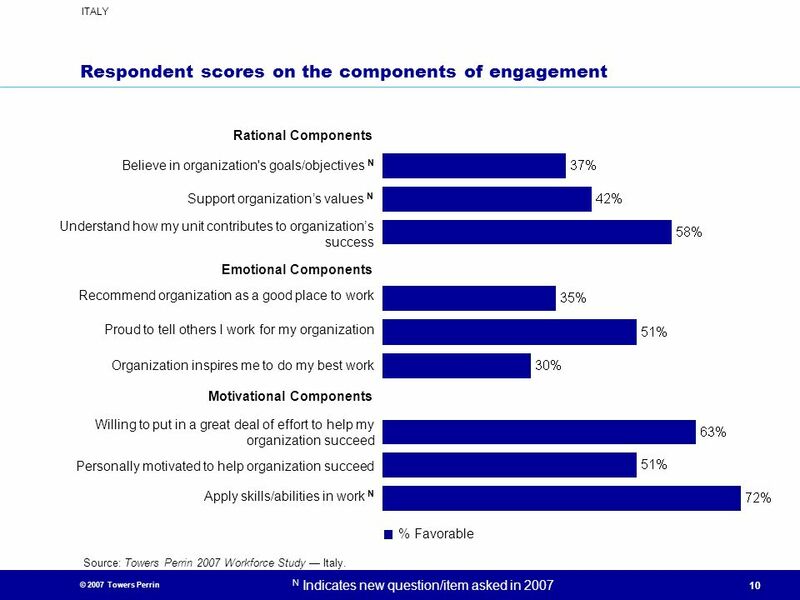 Satisfaction with the organization’s people decisions 1. Senior management communicates openly and honestly 2. Input into decision making in my department 4. Organization quickly resolves customer concerns N 6. Organization supports work/life balance 7. Manager understands what motivates me 8. Set high personal standards N 9. 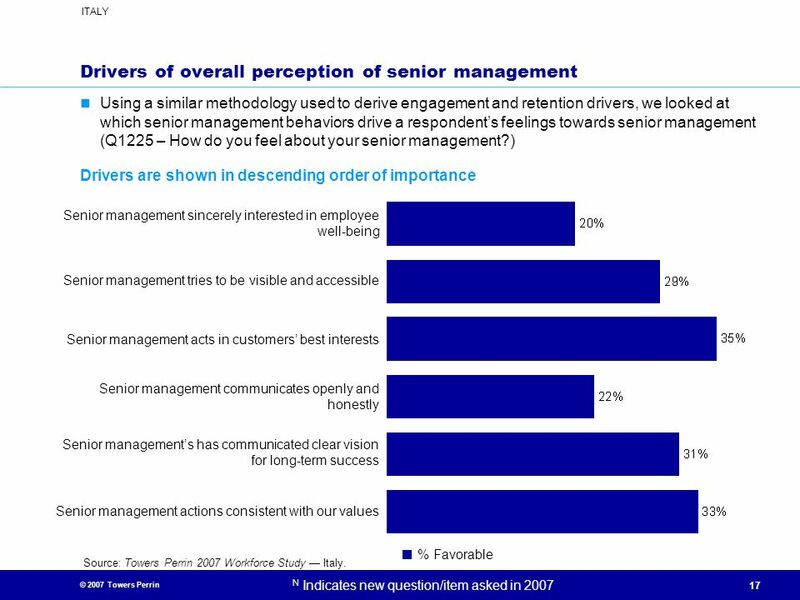 Belief that senior management values the workforce N 10. Can impact quality of work/product/service Source: Towers Perrin 2007 Workforce Study — Italy. Overview of the three sets of drivers (attraction, retention and engagement) Top Attraction Drivers Top Retention Drivers Top Engagement Drivers Challenging work Organization provides clear pay information Senior management interest in employee well-being Competitive base pay My manager handles performance reviews fairly and effectively Improved my skills and capabilities over the last year Career advancement opportunities Satisfaction with the organization’s business decisions My manager understands what motivates me Learning and development opportunities Low- or no-stress work environment Input into decision making in my department Work/life balance My manager provides access to learning opportunities Reputation of the organization as a good employer Salary increases linked to individual performance Can express views openly even if I know people disagree Salary criteria are fair and consistent Collaborative environment Organization retains people with needed skills Opportunities to learn and develop new skills Organization’s financial health Organization allows for flexible work schedule Senior management acts in customers’ best interests High level of autonomy Good collaboration across units Leading-edge technology Appropriate amount of decision-making authority to do my job well Source: Towers Perrin 2005 Workforce Study — Italy. 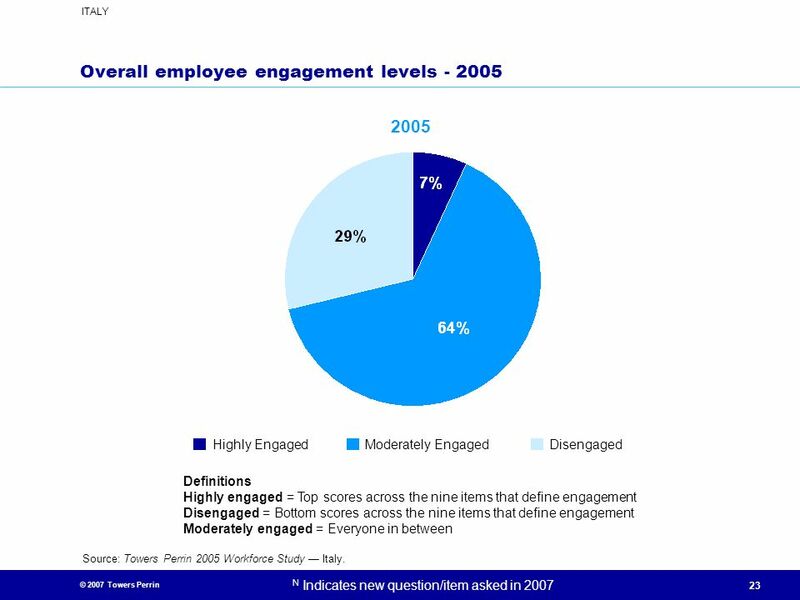 Highly Engaged Moderately Engaged Disengaged Definitions Highly engaged = Top scores across the nine items that define engagement Disengaged = Bottom scores across the nine items that define engagement Moderately engaged = Everyone in between Source: Towers Perrin 2005 Workforce Study — Italy. No plans to leave Not looking, but would consider another offer Actively looking for another job Made plans to leave current job Plan to retire in the next few years Source: Towers Perrin 2005 Workforce Study — Italy. 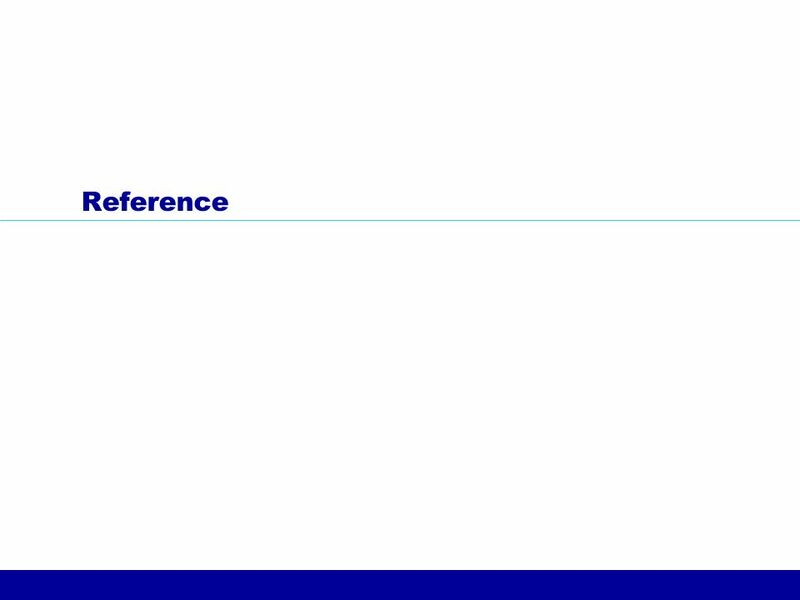 Download ppt "2007 Global Workforce Study"
Older Workers: Employment Expectations CAUCE Conference 2012 Atlanta Sloane-Seale & Bill Kops University of Manitoba. Organizational Behavior MBA-542 Instructor: Erlan Bakiev, Ph.D.
New Hope Baptist Church Sunday, January 29, 2012. COMPENSATION AND BENEFITS STUDY March 21, CONTENTS. 11–13 November 2013 Personal Vision Page 1 Sponsored by Personal Vision Becoming an Indispensable Leader. Hawaiian Airlines Na Leo Survey 2010 Your Results.